A heated swimming pool, open from late May until early September, is a proven magnet for many of our guests. While soaking in the water is appealing for many, basking in the sunshine on one of the poolside deck chairs with a cool drink and a good book is just the right amount of exercise for others. Horseshoes and shuffleboard are available for your enjoyment. The wildlife that shows up on site is a perennial favourite. Friendly deer, rabbits, foxes and many varieties of birds create year round photo opportunities. One of the best vantage points is often from the patio chair on your private deck. With the setting of the sun, your deck is transformed into a place for quiet conversation while admiring the celestial show overhead and possibly even the colorful northern lights. The call of a loon or the hoot of an owl completes the magical mood. Scroll through below for some of the many things to do during your stay with us. West Hawk Lake, mere steps away, is Manitoba’s deepest lake at 111 metres. The extensive sandy beach at West Hawk is considered to be the best beach in the Whiteshell. The clear deep water is superb for swimming and/or relaxing. Complimentary canoes are available at the resort for guests who wish to leisurely explore the lake’s scenic beauty. A convenient marina at the end of the beach has other watercraft available for rent. Cycling enthusiasts thoroughly enjoy the 14 km South Whiteshell Trail which offer views of lake, forest and hills as it winds its way from West Hawk to Falcon Lake. A spur of the Trans-Canada Trail also links West Hawk with Caddy Lake. Exploring the quiet local roads is another option. You can choose to bring your own bikes. You are also welcome to use our complimentary bicycles. If fishing is your preference, you’ve come to the right place. Manitoba Conservation operates a nearby hatchery, which you may tour. It also stocks surrounding lakes with species such as northern pike, bass, walleye, rainbow and lake trout. Many a sportsman has achieved Master Angler status in the area. Only 10 minutes from the resort is The Falcon Lake Golf Course. Tallpine guests are often seen shuffling clubs about their vehicles after having played “the best 18 hole course in Manitoba.” Some even manage to squeeze in a couple of rounds during their stay. If the smaller version of the sport appeals to you, mini-putt is also available in the same area. There are numerous well-marked trails in the area to experience, ranging from an easy half hour walk to more challenging multiple hour hikes. If you’d like to see the park from a different vantage point, we suggest from the back of a horse. Beautiful trail rides at reasonable prices are available for all skill levels just a short distance away. Contact Falcon Beach Riding Stables at 204-349-2410. If you and your partner would like a different sort of love match, free tennis courts are available in town. Complimentary racquets are available at the resort. Safe winter access as we are just minutes from The Trans-Canada Highway. Complimentary cross country ski equipment for our guests. 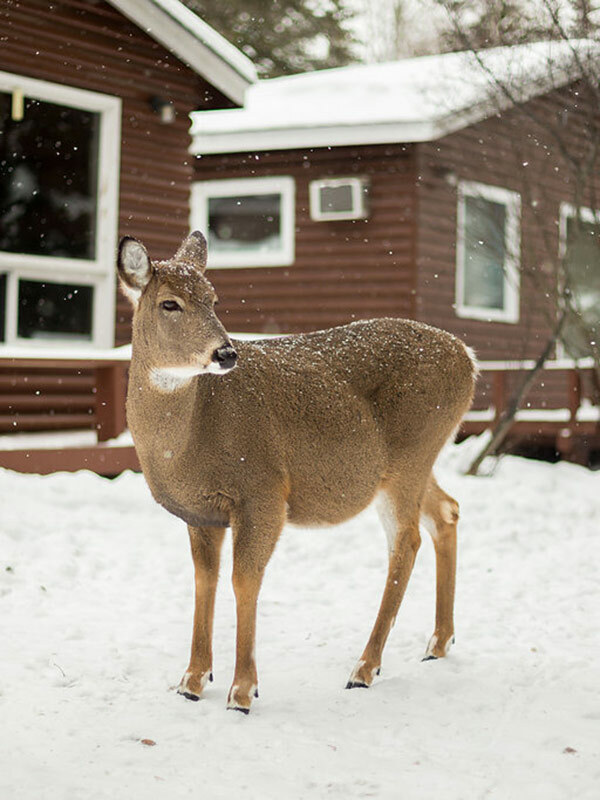 Ideal location in Whiteshell Park: one of Manitoba’s most popular winter wonderlands. Experience the exhilaration of cross country skiing amidst the stunning winter landscape surrounding Tallpine Lodges. From close to your own lodge you are able to access The West Hawk Lake and Area Trail System. They happen to be the most extensive in The Whiteshell. There are three loop trails totaling 20 kms, plus links to the 12 km South Whiteshell Trail and the 7.5 km High Lake Trail. If you are a winter outdoor enthusiast with a taste for speed, then let gravity assist you. Falcon Ridge Ski Slopes offers tubing, downhill skiing, cross country skiing, as well as snowboarding. The slopes are conveniently located roughly 20 minutes from the resort by car. Tallpine Lodges customers receive 15% off full or half day ski/snowboard lift passes, and 15% off full day tubing passes (does not apply to hourly tube rentals). Equipment rentals are available. If you'd like to admire the surrounding winter wonderland from a more comfortable vantage point, consider your automobile. The majority of park roads are maintained throughout the winter. Simply reduce your speed and prepare to marvel at the postcard like scenery. You'll pass through snow covered rock cuts, beside countless frozen lakes, along tree lined corridors and the observant will be treated to views of wildlife in their natural habitat. Don't forget your binoculars! Looking for something different? Only ten minutes away you can take a step back in time and explore the beauty of the tranquil countryside as it was done one hundred years ago. Your exciting horseback or sleigh adventure awaits you. Contact Falcon Beach Riding Stables at 349-2410. With the abundance of lakes in the area, there's no shortage of exciting angling opportunities to be had. 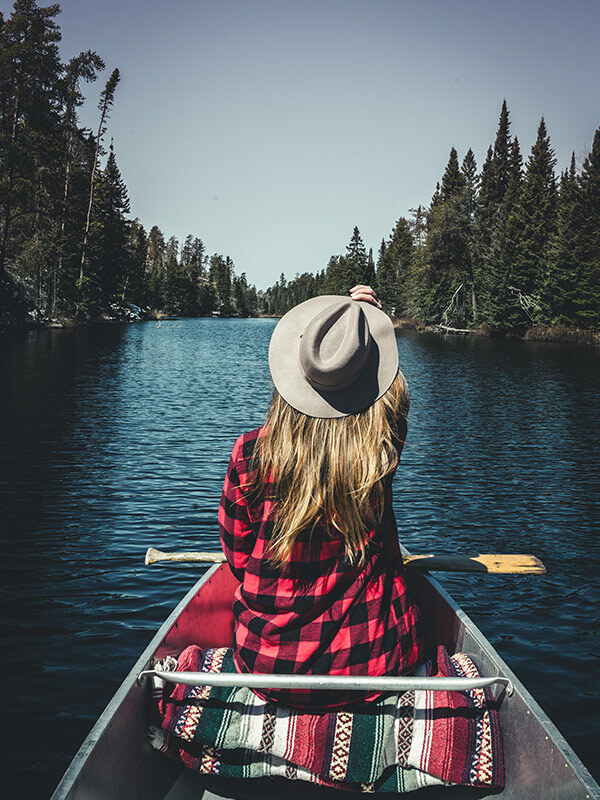 Couples thoroughly enjoy outings to nearby stocked lakes such as West Hawk, Lyons, Hunt, and Camp. While most guests return with walleye and trout... and a big smile. For both active and more laid-back couples, when the wind howls, the temperature drops and the snow begins to pile up outside, appreciation for the cozy interior of your individual lodge increases. No need to feel guilty about not being outside doing something. The welcoming warmth of your personal sauna and soothing jacuzzi quickly become romantic destinations in themselves. Combine that with a candlelight dinner, possibly a movie, a little snuggling in front of the flickering fire and you have all of the necessary ingredients for an unforgettable romantic winter getaway! 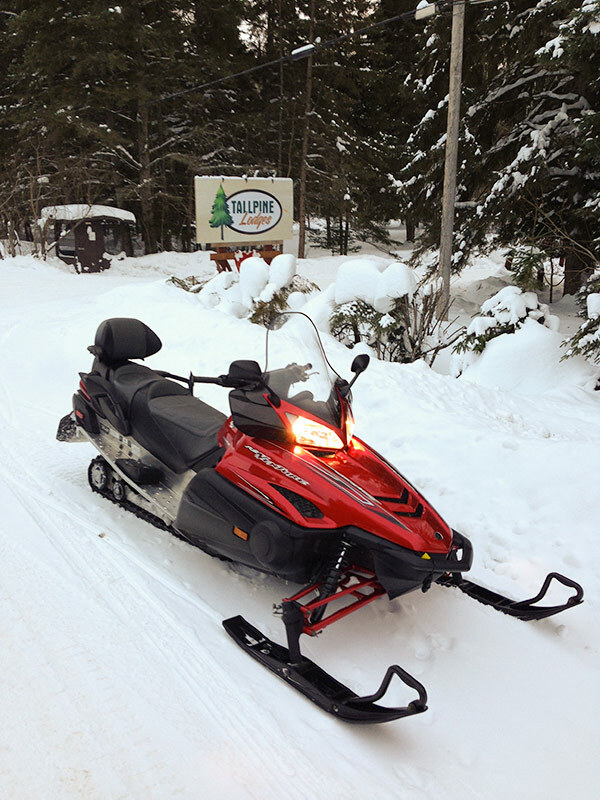 Many couples are snowmobile enthusiasts and have discovered the more than 250 Km of Whiteshell groomed trails to be unsurpassed. Rentals available to guests of Tallpine Lodges, please call for pricing. Fuel is paid for by the customer, and a $500 deposit is required. Taxes are on top, and its unlimited mileage. Snoman pass is included, and we will provide helmets. With snowshoes and a little energy, there's numerous interesting adventures possible from the resort. Couples may choose to explore one of the nearby blazed hiking trails, or simply to take a few steps behind their lodge, to immerse themselves in the peaceful solitude of winter in the boreal forest. The original inhabitants of the region, The Anishnabee, were so impressed by the area, that they deemed it to be sacred. After having fallen under nature’s spell you too may choose to further explore it’s tranquil beauty by foot. 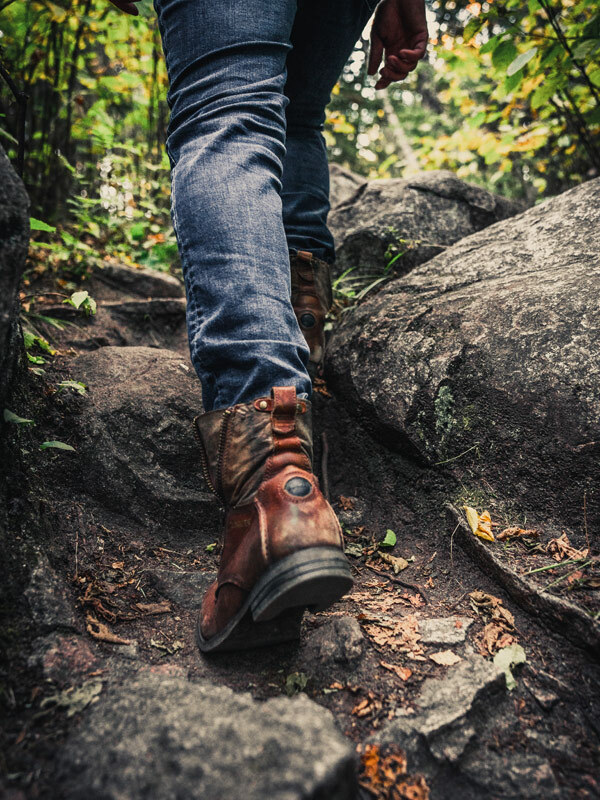 There are numerous well-marked trails in the area to experience, ranging from an easy half hour walk to more challenging multiple hour hikes. Only a short drive from Tallpine Lodges, the Hunt Lake Hiking Trail is a favourite with guests. This 12.6 Km round trip trail leads north to Indian Bay returning along the east shore of West Hawk Lake. Guests should allow themselves 3-4 hours to enjoy the trail. Expect steep, difficult climbs that will reward you with spectacular views of the lake and countryside. This trail is a short and pleasant trail that shows a typical Canadian Shield drainage system. Guests can take the short loop (2.8 Km, 1 hr) or longer trail (4.6 Km, 2 hr) which reaches McGillivray Lake. Please be aware that the rock surface can be slippery when wet, and wear suitable footwear. The trailhead is located north of the Trans-Canada Highway near the entrance to Falcon Lake. A trail guide/activity booklet is designed to help visitors become familiar with geological features they’ll encounter during their walk. Distance 2.2 Km, 1-2 hr. A local trail within easy walking distance that will take you up the rocky outcrop above the town site and reward you with beautiful views over the lake. This 14Km section of the Trans-Canada Trail offers views of lake, forest and hills as it winds its way from West Hawk to Falcon Lake. It is a wide, well maintained, relatively smooth surface trail, with easy walking. A novice trail which loops to and from The Whiteshell River. It is interestingly situated in the transition zone between the Boreal Forest and the Great Lakes/Saint Lawrence Forest. Distance 2.8 km, 2hr.